Here is a recipe for a gorgeous luxurious treat that is super yummy-full called "New York White Chocolate Cheesecake". 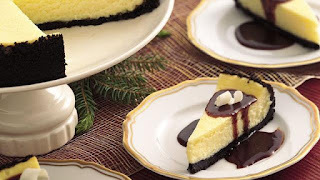 Check out the recipe below..
Get big "wow" factor with this luxurious dessert, with white filling and dark sauce thanks to convenient chocolate chips. Place 12-inch square sheet of foil on rack below center oven rack in oven. Heat oven to 325°F. In medium bowl, combine crust ingredients; mix well. Press in bottom and about 1 inch up sides of ungreased 10-inch springform pan. Refrigerate while preparing filling. Beat cream cheese in large bowl with electric mixer at medium speed until smooth. Gradually add 1/2 cup sugar, beating until smooth. Add eggs, 1 at a time, beating well after each addition. Quickly add melted chips, whipping cream and vanilla; beat until smooth. Pour into crust-lined pan. Bake at 325°F. for 55 to 65 minutes or until edges are set; center of cheesecake will be soft. Turn oven off; open oven door at least 4 inches. Let cheesecake sit in oven for 30 minutes or until center is set. Remove cheesecake from oven. Cool in pan on wire rack for 1 hour or until completely cooled. Carefully remove sides of pan. Refrigerate at least 4 hours or overnight. In small heavy saucepan, combine chocolate chips, 1 tablespoon butter and boiling water. Let stand 5 minutes. Whisk chocolate mixture until smooth. Add 3/4 cup sugar and corn syrup; mix well. Bring to a boil over medium-low heat, stirring constantly. Reduce heat to low; boil 8 minutes without stirring. Remove saucepan from heat. Stir 1/2 teaspoon vanilla into chocolate sauce. Cool 15 minutes, stirring frequently. Sauce will thicken as it cools. Serve cheesecake with sauce. Store cheesecake and sauce in refrigerator. Wrap outside of springform pan with foil; prepare cheesecake as directed above. To help prevent cracking, place pan filled with 1 to 2 inches water on oven rack below cheesecake during baking. Bake at 325°F. for 60 to 70 minutes.